Not too many people end up trapped and bound in duct tape at any point in their lives, but those who find themselves in such a situation would no doubt find the Titanium Escape Ring immensely useful. The ring looks like a regular silver ring when it’s on the finger. Its secret only becomes apparent when you slip it off and look at the inside. 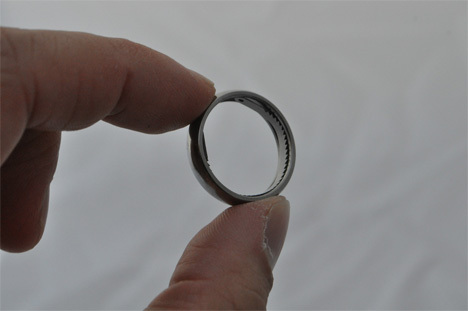 Coiled around the interior surface of the ring is a tiny piece of metal. One of the long edges features a serrated blade that can be used as a saw or knife to cut zip ties, duct tape, rope or other non-metallic objects. 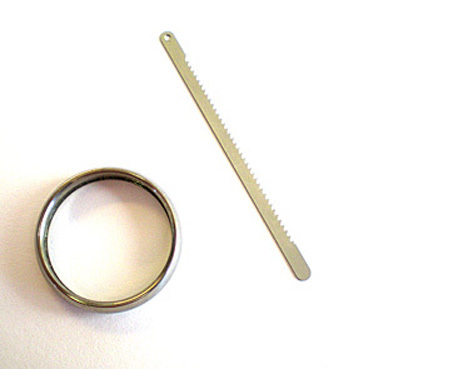 The metal piece can also be used as a shim to pick locks. 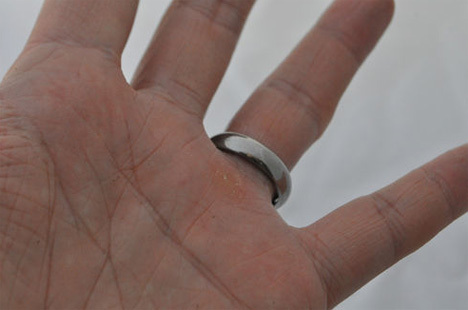 After you slip the ring off, the little metal piece pops out easily and lets you do whatever you need to do to escape your current situation. Hopefully you’ll never need it, but as the ring’s eBay seller says, it’s just another tool that can help keep you safe if it ever becomes necessary.